Over the last several months I have had requests from some school leaders to provide a day or two day training for their staffs in PLC skills and strategies. Most often these leaders are identifying either a desire to initiate PLCs on a solid footing or a desire to fix PLCs that have gone wrong in how they invest their time. In each case I shy away from a workshop or training that extends more than three hours. I’m often suggesting Skype sessions that lay out a next step set of tasks that start the staff working as PLCs. Instructional coaches, teacher leaders or building administrators can then serve as coaches providing feedback and understanding as the teachers work through the PLC process and identify a need for processes and/or communication skills. Skype can also allow me to provide some of that coaching directly as I can “sit in” on individual PLC sessions. I recently worked with an instructional coach to map out the following plan that he will use to lead his middle school staff through their introduction to functioning as a PLC. I am hoping the structure might be helpful to others tackling similar implementation and the necessary teacher learning needs. Following the Big Ideas from Dufour (earlier blog) we first identified the need for a PLC to be results focused; to identify the student learning outcomes that will indicate success. I suggest that this be approached through the setting of goals for a group of students who will be the focus of the PLC. In this case the school leadership team has selected improving student writing as a schoolwide goal. The PLCs are formed of middle school, cross content teachers who are members of a team serving a common group of approximately 115 students. There are two teams at each grade level: sixth, seventh, eighth. Each team will be asked to select 15-20 students who will be the focus of their PLC efforts. The team will be asked to assess the writing skill level of the selected students at the beginning of the year and indicate end of year goals that would signal desired student learning. Students who are below proficiency at the start of the year, but not the most remedial, are requested to be part of the selected group. I strongly recommend that some top writers be selected as well so that goals for their learning can be set. The second Big Idea is to have the focus of PLCs work more on learning than on teaching. This element will occur as the PLC frequently examines writing products from the selected students’ work in multiple content areas and types of assignments. As teachers together analyze student work and progress, they will identify the student experiences and behaviors needed to gain the desired skills. Teachers will create the learning opportunities to generate the critical student learning behaviors. Student work is crucial for focusing PLCs on learning. I find teacher learning is more likely to emerge from a study of student work than occurs from a study of data. Examining student work puts teachers’ choices of learning tasks and samples of teacher feedback to students “front and center” with colleagues….a great teacher learning opportunity. 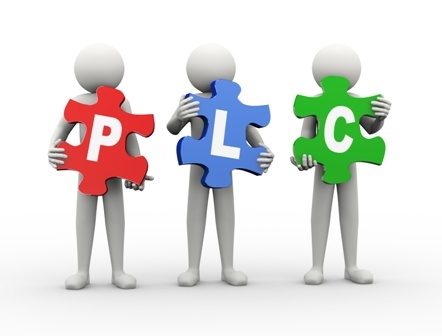 The third Big Idea is that PLCs are collaborative. I describe that collaborative work is generated by shared goals. The design of this PLC focus will have the involved teachers assuming shared responsibility for each of the selected students achieving the goals that have been set. This accountability to each other as well as to the students should build teachers functioning as a team. This diagram illustrates what I envision being the ongoing process of these PLCs. The process begins with teachers observing students’ current writing skills and thinking about the desired goals and outcomes needed. Having identified the student production behaviors that are most likely to cause the learning outcomes, teachers create the learning experiences and tasks that they will implement. 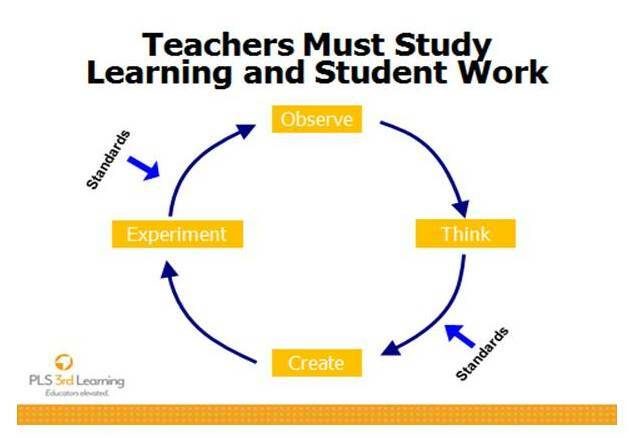 The experiment component involves the teachers engaging the students in the learning process. Observation of the students during the learning activities and of the students’ writing products will provide information to guide ongoing thinking and creating of next steps. The design of this initial implementation focusing on 15-20 students as a team should generate application of insights and learning to impact the writing of all students and hopefully impact teaching and learning in other content areas as well. Doing PLC work is essential to learning PLC skills. Loved working with you in Alden schools. Still keeping track of your work. Excited that you will be working with my friends in Southwestern schools in Chautauqua County! Loved working with you in Alden schools. Still keeping track of your work. Excited that you will be working with my friends in Southwestern CSD in Chautauqua County!